As some 300 motorcycle riders and passengers arrived at Los Encinos Park on Sunday, May 6th after completing the motorcycle ride from Harley Davidson in Glendale, a rainbow appeared in the sunny, blue, but cloudy sky. Rainbows have long been associated with Ronnie James Dio and his music, and the colorful presence seemed to signal the late singer’s approval of the event created in his memory. The 4th Annual Ride For Ronnie Motorcycle Rally and Concert attracted motorcycle enthusiasts and rock music fans alike and raised some $50,000 for the Ronnie James Dio Stand Up and Shout Cancer Fund. Dio Cancer Fund co-founder and president Wendy Dio warmly greeted those who gathered in Glendale for the Ride before once again leading the procession of motorcycle riders for the morning RIDE to Los Encinos Park in Encino, California. Among those participating in the Ride this year were actors Star Fields (Sons of Anarchy) and Al Coronel (The Last Ship), actor and musician E.J. Curse, Faster Pussycat’s Taime Downe and former Guns N’ Roses guitarist Gilby Clarke, plus Dio Cancer Fund Medical Director Dr. Sandy Kapoor and event sponsor KLOS Radio air personality Frank Kramer of the Frosty, Heidi and Frank morning show. 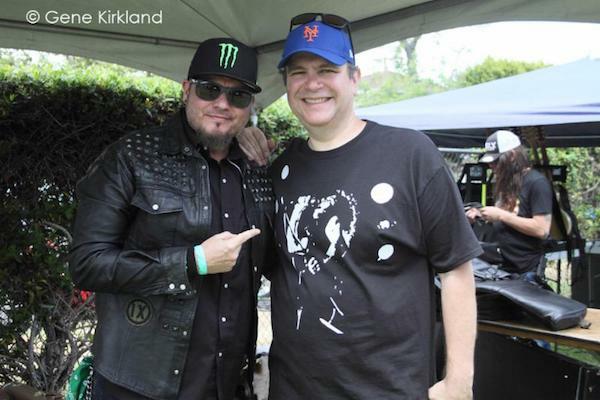 The afternoon of live music following the Ride, hostedby radio and television personality Eddie Trunk who was joined by KLOS’ Melissa Maxx, kicked off with Long Beach, CA hard-rockers Railgun. They were followed by the very first live performance by Classless Act, formed by childhood friends Nico Tsangaris on lead guitar and drummer London Hudson, the 15-year old son of guitar god Slash. They performed their version of Black Sabbath’s The Mob Rules in honor of Ronnie James Dio who wrote the song. Other bands that performed throughout the day were: The 10-piece Lynyrd Skynyrd tribute band One More From The Road, Beasto Blanco, Dio Disciples, featuring: Simon Wright, Craig Goldy, Scott Warren, Bjorn Englen and singers Oni Logan and Tim “Ripper” Owens) and Steven Adler’s All Star band, featuring Marten Andersson (LizzyBorden, Steelheart), Ira Black (I Am Morbid, Metal Church, Lizzy Borden), Robert Crane (Black Star Riders), Mike Dupke (Dee Snider, W.A.S.P. ), David “Rock” Feinstein (Elf), Constantine Maroulis (American Idol, Rock of Ages), Tanya O’Callaghan (Dee Snider), Carl Restivo (Tom Morello’s Nightwatchman, Street Sweeper Social Club, Perry Farrell’s Satellite Party, Rihanna), Joe Retta (Dio Disciples, Heaven & Earth), Joey Scott (Lizzy Borden), Patrick Stone (Budderside), Michael Thomas (Faster Pussycat), and Ricky Warwick (Black Star Riders, Thin Lizzy, The Almighty). The bands held Meet and Greets for fans during the course of the afternoon, and a raffle and music memorabilia heavy silent auction brought in additional donations. The silent auction included an Elton John Tour Program, a signed Heavy Metal Hall of Fame poster, a KISS Waffle Maker and a full Pantera discography on vinyl among many other items. Wendy Dio and Dio Cancer Fund Medical Director Dr. Sandy Kapoor presented a check for $25,000 to Dr. David Wong of the UCLA School of Dentistry to further his team’s research into the development of a simple, non-invasive saliva test for the early detection of cancer. Dr. Wong surprised the crowd with the news that an early form of this test will be available some time this summer. For more information, visit diocancerfund.org.